Here is an easy recipe to add to your list of Christmas activities for kids. 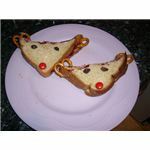 Students will make sandwiches which look like Rudolph! Kindergarten activities listed below can be conducted as a group, or written on posterboard as a lesson in following directions. Set up a holiday snack center with all of the materials listed above, except the posterboard and the marker. These will be used to create the step-by-step instructions that students are to follow in order to create their own Rudolph sandwiches during the holiday. Follow these simple directions to create your own holiday snack. When you are finished, ask a friend to complete a partner checklist to be certain you have followed each step correctly. Take one slice of bread. 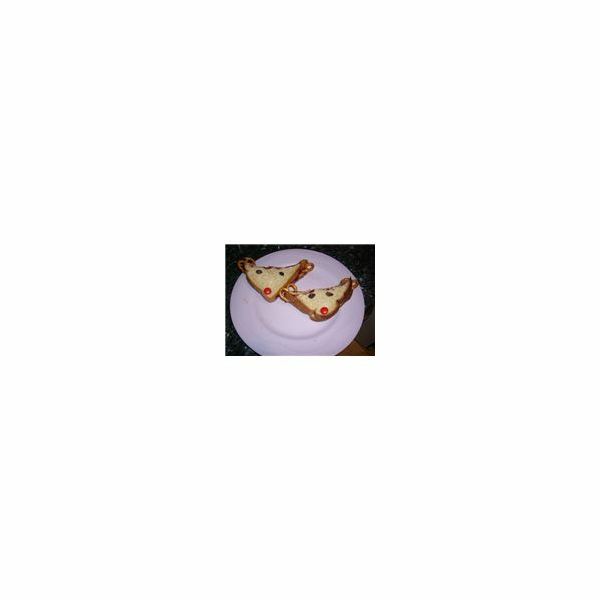 Lay bread on round plate. Using plastic knife spread peanut butter on the bread. Cut the bread into 2 triangles. Lay triangles on top of one another (with peanut butter inside) to form one triangle. Add 2 raisins for the eyes. Add 1 strawberry half for the nose. Add 2 antlers to the top of your Rudolph by using broken pretzel pieces. Ask a friend to use the Partner Checklist to be certain you have followed all of the directions carefully. If all of the directions have been followed accurately, you are ready to enjoy! He's Got a Checklist, He's Checking it Twice! Use the following statements to create a checklist for your holiday snack center. You may wish to include a blank line next to each item so that the partners can actually make a check to show that the step has been completed accurately. Or, you may prefer to use a "Yes/No" format, and have the children circle the appropriate response. You have a reindeer head that is shaped like a triangle. The head is made of 2 pieces of bread. There is peanut butter in between the two slices of bread. The Rudolph sandwich has 2 raisins where the eyes should be. The Rudolph sandwich has 1 strawberry where the nose should be. The Rudolph sandwich has 2 pretzels where the antlers should be. As with any activities for kids, be mindful of students with peanut allergies. If this is the case, you may wish to use something other than peanut butter for your holiday snack center. Jelly, cream cheese or even American cheese slices are all possible alternatives. If you are using this holiday snack activity for a classroom party, you may wish to substitute triangle-shaped cookies for the bread slices. Students may then use frosting, sweetened cream cheese or even jelly for the filling. Chocolate chips could be substituted for the eyes, and a cherry or red chocolate-covered candy can be used in place of a halved strawberry for the nose. If you have other Rudolph kindergarten activities you use at home or in the classroom, please share them in the comment section below. Look for additional Christmas activities for kids from this author.